What is it? – Moonrocks is a base-defense strategy game, with some interesting gameplay twists that set it apart from numerous other games of its ilk. Who made it? – Patrick and Sarah Allen of PocketStrategy. How does it play? – Each campaign begins on a large map of the galaxy. Your goal is to race two competitors to a “destination planet” by using other planets to leapfrog across the map while battling your rivals for territorial control. The mouse and menu-driven controls are much like other base-defense games. Succeeding in the numerous campaigns will require careful resource management and strategic upgrading. You can purchase new unit types between levels (or upgrade existing ones). 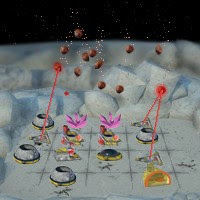 In one of the better gameplay twists, you can wage counterattacks against your opponents’ bases in the form of icy or fiery meteorites, or even attack ships. Special attacks have building and resource prerequisites, so you’ll need to use them sparingly. Presentation – The game sports an appropriately sciene-fictiony look, and it’s easy to differentiate one structure from another. Building and upgrading is also a streamlined process, which is good when you’re rebuilding amidst a maelstrom of falling debris. Positives – Moonrocks is great amalgamation of tower defense games and the arcade classic Missile Command, and breathes some new life into a crowded genre. It also contains numerous challenging campaigns and great replay value. Negatives – Some players might be put off by the game’s length and level of challenge. Planning your progress through the unit tech-trees can also be a hit-or-miss proposition; at least until you become familiar with how all of the units and structures fare against the different enemies. Why you should play it – If you’re a fan of tower-defense games, trying out Moonrocks should be a no-brainer. The game has a surprising amount of depth and replay value, and being able to counterattack enemy bases is a welcome gameplay addition.